Thank you Mr. President. I congratulate Angola on its successful leadership of the Council this month. I would like to take this opportunity to thank Mr. Nicholas Haysom, Special Representative of the Secretary-General and head of UNAMA, for his briefing and for his outstanding leadership of the UN’s work in Afghanistan. 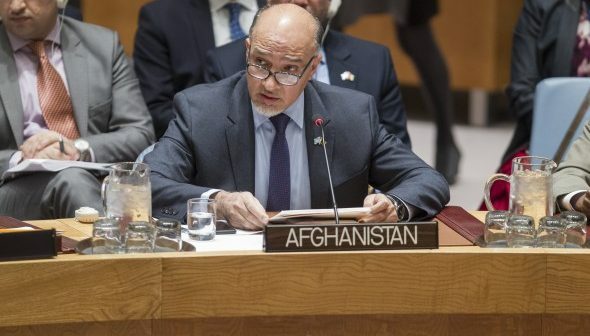 I thank the Secretary-General for his recent report on the situation in Afghanistan, which offers a lucid overview of the prevailing situation in my country. Since the Council’s last deliberation on Afghanistan in December last year, we have witnessed important gains in several key areas. Enhanced regional and global cooperation has brought renewed hope in our peace efforts with the armed groups; the sustainability and enabling needs of our security forces have received fresh attention with good deliveries from regional and global partners; our security forces have conducted large-scale operations and flushed out terrorists and extremists in several districts and villages across the country; Government inclusivity and social outreach has improved political stability; the Government has met human rights benchmarks through multiple progressive legislations; electoral reform has received fresh momentum; a number of key senior appointments has increased professionalism in governance; measures to increase revenue mobilization have brought results; increased rate of voluntary return of our nationals prove that more people are returning to Afghanistan; also, there has been substantial reduction in opium cultivation and production. With the Afghan New Year just days away, these developments give hope for more promising times for us. The renewal of UNAMA’s mandate is another affirmation of the strong partnership between Afghanistan and the United Nations. On this occasion, we are grateful for the UN’s vital contributions to our security, development, and rehabilitation. We welcome the reflection of the recommendations of the Tripartite Review Commission in the renewed mandate of UNAMA. Using this opportunity, let me thank Ambassador Román Oyarzun Marchesi and his entire team for doing a fantastic job on the negotiations. With preparations in progress for security, political, and development discussions on Afghanistan at the forthcoming NATO Summit in Warsaw and the Brussels Conference, there are clear signs that Afghanistan once again is turning into a symbol of international cooperation with the National Unity Government as a trusted partner for all. We look forward to continuing our partnership with the international community over the coming years, and are confident that our joint success in stabilizing the situation and achieving peace and prosperity is inevitable. We continue to face challenges from the Taliban, Daeish, Al-Qaeda, and other violent extremist and terrorist groups. Their human rights violations persisted during the usual winter lull, resulting in high civilian causality rates, massive internal displacement, and increasing instability in different parts of the country. In the face of mounting struggles, Afghans have remained united in a commitment to thwart these groups. Following last December’s Ministerial Conference of Heart of Asia-Istanbul Process in Islamabad and its side meetings, increased efforts have aimed to restore peace talks. The Quadrilateral Coordination Group (QCG), consisting of Afghanistan, Pakistan, China, and the United States, has met four times in two months in Islamabad and Kabul, and succeeded in finalizing a road map for the next steps forward. Moreover, the appointment of a new leadership team for the High Peace Council inside Afghanistan has reinvigorated the promotion of peace. We will spare no efforts to grant our citizens their fundamental right to live peaceful and dignified lives. Despite these important developments, we are cognizant of the challenges ahead of us. So far, QCG’s call for peace talks have received mixed reactions. Some groups have expressed readiness to attend the talks, some are weighing their options and some are attempting to raise the stakes. Two weeks ago, Mr. Sartaj Aziz, Foreign Affairs Adviser to Pakistan’s Prime Minister Nawaz Sharif, publicly stated that his Government had “influence on the Taliban” because their leadership, together with their families, live in Pakistan. Mr. Aziz’s statement speaks volumes about the crucial need for Pakistan to play its role in helping to facilitate direct talks between authorized representatives of the Taliban and the Afghan Government. We repeat our call to the Taliban to engage in the peace talks and to give up violence. We assure them that they will be among the first beneficiaries of the peace dividend. At the same time, let me make it clear in no uncertain terms, that those elements who choose the path of violence and terror will face the full might of our security forces, and be held accountable, no matter whose protection they enjoy. We welcome the growing voice of reason within Pakistan calling for a change in the right direction. In light of that, we want an immediate end to regular incursions along the Durand Line, which cannot and will not be tolerated by Afghanistan. In the last three months alone, we have documented at least 56 instances of violation to the sovereignty and territorial integrity of Afghanistan across the Durand Line, breaching article 2 (4) of the UN Charter and contrary to UN resolution 2131. This jeopardizes Afghanistan-Pakistan relations at a time when making peace with Pakistan is essential to making peace with the Taliban. Despite our high ambitions and political will, we have realistic expectations from the peace process. Success depends on a number of factors at national, regional, and international levels, including adequate handling of spoilers of peace. At the national level, violence must decrease so that we can win the confidence of our people, especially women, over the process. Ultimately, the peace process should further unite Afghans rather than divide us. Every effort must be made to eliminate those elements of the armed groups that oppose peace. We anticipate clear and decisive steps towards this objective. At regional and international levels, we should aim for minimizing negative state rivalries and maximizing cooperation. States have the right to be concerned about their interests; however, they don’t have the right to pursue them through violent means and proxies in others’ territories. The price of greatness to regional and global powers is responsibility and better coordination of legitimate interests of all. Given its sensitive geostrategic location, history of turmoil and current embroiling with global violent extremism and terrorism, Afghanistan must continue to remain a symbol of international cooperation. While we deliberate, terrorists and violent extremist groups, including Daeish and Al-Qaeda, continue to threaten the foundations of our society. Everything we cherish– equality, democracy, justice, and human rights is under attack from their daily onslaught of violence. We are in a constant battle between legality and illegality, civilization and darkness. For our part, we will continue our more than two decade long struggle against the menace of terrorism. We will do so as a matter of national and strategic priority. Having said that, ridding this menace from Afghanistan, our region and beyond, demands more robust efforts, regionally and globally, by all States – particularly those in which extremist groups originate. The time is now to strengthen the overall international architecture against terrorism. 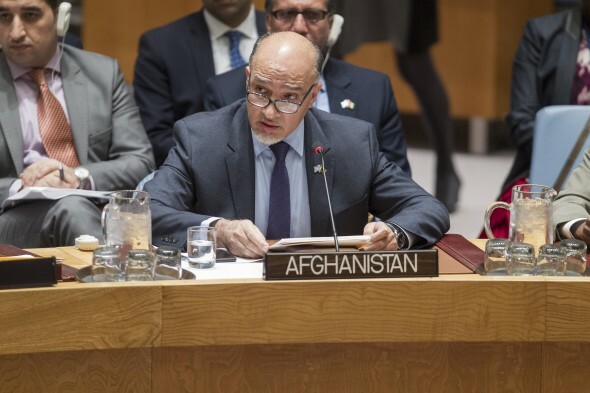 Afghanistan has long advocated the conclusion of the draft Comprehensive Convention on International Terrorism. As we struggle to reach a common definition of terrorism, we must remind ourselves of the enormous pain and suffering that extremism inflicts on the civilized world. Think about the loved ones of 146 people who have either lost their lives or have become wounded in the terrorist attacks of the past couple of days in Ankara and Ivory Coast. This Council should ensure that all States meet their international obligations with respect to implementation of the relevant counter-terrorism and sanction regime resolutions of the General Assembly and Security Council, in particular resolutions 1373, 1624, 2178, 2253 and 2255 and present genuine and regular compliance reports. While we press for the success of the Peace Process, Afghanistan must be able to defend its sovereignty and territorial integrity, and protect its citizens. While we agree there is no military solution to the security problems imposed on us, we firmly believe that without an effective defense and security system, there will be no solution. In the past three months, despite limited resources, the initiative has very much remained in the hands of our security forces. They have had success in a number of provinces including Nangarhar, Baghlan, Helmand, Badakhshan, Takhar, and Faryab. In Helmand, our forces have repelled sizeable enemy attacks, despite sustaining heavy casualties. However, the cost of war imposed upon us is massive, and way beyond our own capacity. Sustainability, proper training, right enablers, reform, and high morale of the Afghan National Defense and Security Forces (ANDSF) are crucial in facing the regional and global terror threat. Lately, the United States, India, China, and the Russian Federation have contributed to the delivery of the right enablers to ANDSF. We are looking forward to the Warsaw Summit of NATO in July, where the long-term sustainability of the ANDSF will be discussed. Afghanistan continues to make strides in civilian protection and promotion of human rights, especially protecting the rights of our children, which has always been our priority. We will continue to implement the “Road Map to Compliance” to prevent recruitment of child soldiers, having already endorsed the National Age Assessment Guidelines to ensure we bring an end to practices that put the lives and futures of our children at risk. 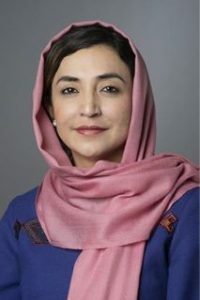 The recent Afghanistan visit of Ms. Leila Zerrougui, Special Representative of the Secretary-General for Children and Armed Conflict, provided an excellent opportunity for a first hand assessment of the situation. Our pledge to empower women and ensure their equal rights is bearing fruit. Multiple Government initiatives continue to encourage women’s participation in all sectors while the strengthening of existing laws on violence against women help to create a just society. In the past three months, we have witnessed multiple attacks on civilians, including slaying of journalists of a popular television network. Following this incident, President Ghani has affirmed his commitment to freedom of expression by issuing a decree to prevent the intimidation. There is significant political will to consolidate the progress made in the past years. However, the high price paid by Afghans due to the imposed conflict pulls us in a downward spiral. The Council must note that our Government’s policy is to protect civilians at any cost. ANDSF operates under strict rules of engagement based on principles of justifiability and proportionality, provide compensation and support to victims of violence, and never use any civilian facilities for military purposes. Afghanistan is currently suffering a humanitarian crisis of epic proportions. The number of internally displaced people is at its highest since 2002, but the rate of voluntary returns under the repatriation program has seen a significant increase since 2014. However, the continuous flow of Afghans out of the country is a source of concern as they contribute to the migrant crisis in Europe, constituting the second largest group of arrivals via the Mediterranean Sea route. Compounding the crisis, several European countries have started rejecting Afghan asylum petitions. It is our Government’s policy to improve conditions in Afghanistan so that we can create economic opportunities and strengthen security, to incentivize people to stay and contribute to their nation. We call upon our friends from the international community to work with us in achieving this goal. Countering the menace of narcotics trade and breaking down the nexus of criminality and drugs are key priorities for us. Our success is evident from the findings of the 2015 Afghanistan Drug Report, which emphasizes significant reductions in opium cultivation and production, and slight increases in drug seizures. We will continue to work with the international community to garner support on the Afghan National Drug Action Plan to counter the threat of illicit drugs. No country can achieve self-reliance without economic self-sufficiency, and Afghanistan has been adopting concrete measures to move in that direction. In line with Sustainable Development Goals, we are in the process of drafting a new National Development Strategy, the guiding document on strategies for security, governance, economic growth, poverty reduction and employment. We are serious in dealing with corruption because it negatively impacts economic growth. In this regard, the Government has implemented multiple anti-corruption strategies, and started programs that would ensure transparency of recruitment in public service and prevent nepotism. 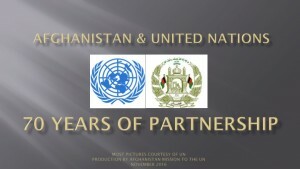 In October, the Brussels 2016 Conference on Afghanistan is expected to convey a message of strong political support for our reform and state building process, commit development assistance in support of Afghanistan’s reform process within an updated Mutual Accountability Framework, and create a political momentum of reinforced regional cooperation. We invite member states to take an active part in this conference as investing in Afghan stability would create safety dividends worldwide.